Nowadays skin pigmentation has become a common problem. Pigmentation is usually caused by excessive melanin production due to genetics, sun exposure, stress and hormone imbalances. The main focus on treating pigmentation is to eliminate melanin in the skin without harming the surrounding skin tissues. Currently, there are two proven methods to effectively treat pigmentation. We stock the most advanced and effective skin peels to address pigmentation including Cosmelan Depigmentation treatments from Mesoestetic. The treatment’s principal action is elimination of melanin patches on the face – including melasma. IPL Laser Skin Rejuvenation utilises an intense pulse of light (IPL). It passes safely through the top layer of the skin to heat and thermally destroy pigmented lesions such as brown spots, age spots, and flat brown birth marks. The surrounding skin tissues are not affected in this process. It is very important to commit to the use of the homecare products that we will prescribe to you. This is to maintain the suppression of melanin production after the initial professional treatment in the clinic. Your therapist will give you detailed usage instructions. We have designed each of the above programme depending on the level of downtime you will experience, your time and budget. We aim to provide you with a personalised approach in order to deliver optimum results. Cosmelan aims to reduce and eliminate skin blemishes of melanic origin. 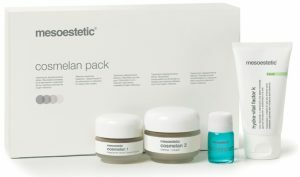 We have tried and tested Cosmelan within the clinic before introduction to our clients. The effectiveness of the treatment turned out to be amazing. As a result, Cosmelan has become one of our key products to treat pigmentation, and we would highly recommend it to our clients with hormonal pigmentation concerns.